This is a brand new 2in1 SMD Rework Soldering Station 898D+ which is improved from 878 series and inherited all advantages. Alloy metal body with high-quality silicone shell features elegant appearance and power saving. You can use hot air gun and soldering iron separately, with no interference with each other. SAMSUNG chip control circuit adopted, it ensures rapid warming-up and stable accurate temperature control which at the same time not affected by airflow to really achieve lead-free soldering and desoldering. Especially suitable for mounting and reworking SMD components by hand. Really a must have! 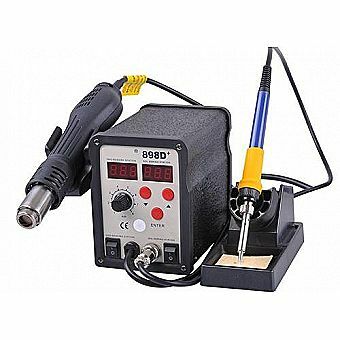 Don't be hesitant to have a set of 2in1 Rework Soldering Station 898D+ for your business! *Please read the user's manual before use.